Today we are releasing a teaser-page for Tripbirds. I must say it's pretty sleek, so check it out. The teaser page shows you how far you've traveled on Facebook. And if you've ever used Foursquare, Gowalla or Instagram you can connect and get your trips from those services as well. In the bigger perspective, it shouldn't matter which of all social services your friends use to keep track of their whereabouts. You should still be able to use Tripbirds. 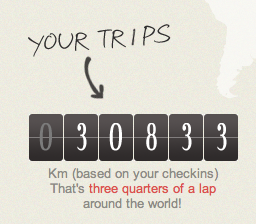 Myself, I've traveled three quarters of a lap around the world. You might think that's quite far, but I have 45 friends who have traveled further. Maybe I'm not such a globetrotter after all. One interesting thing about the teaser page is that behind the scenes our machines are doing a lot of heavy lifting - fetching thousands of trips and crunching tons of data every time someone connects. Jonatan, Robert and Philip (the developers) have really succeeded in making it all look so simple. Great work, guys. 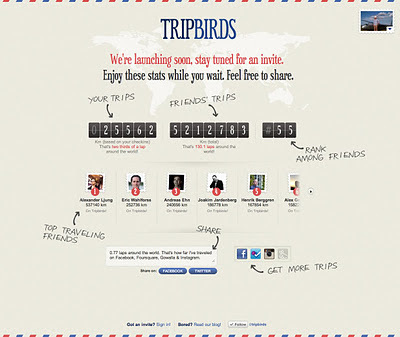 Quite soon we are launching the full Tripbirds site, in private beta. By signing up for the teaser you make sure to be one of the first in line for the real thing. You can also invite your top traveling friends on Facebook. Those are the people that will naturally get the most use out of Tripbirds. 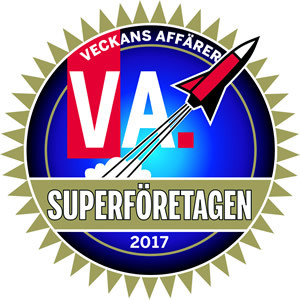 Riktigt snyggt, ser riktigt bra ut!